How Much Water Does My Crayfish Need in an Aquarium? Crayfish are attractive, beautiful freshwater lobster-like creatures. 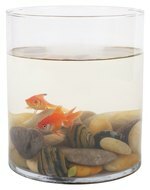 They make great aquarium pets, as they are easier to feed and care for compared to fish. However, when you are keeping crayfish as a pet, you need information on the amount of water this creature needs. Many people end up losing their pet crayfish because they do not have proper knowledge about the water needs of crayfish. Crayfish have gills and breathe oxygen from the water. If your aquarium is equipped with an aerator, you can fill up the aquarium completely. The aerator will maintain the oxygen levels in the water. However, keep a close watch on the water and change it the moment the water smells a little off. If you overfeed the crayfish, the water will get smelly fast, as the uneaten food will rot. It is best to change around 25 to 50 percent of water once a week. Without an aerator, a crayfish will die as it will not be able to meet its oxygen needs. Hence, if you are not using an aerator, do not fill the aquarium completely with water. Fill just few inches of water in the aquarium and a rock, so that the crayfish can come out of the water if required. This will prevent the crayfish from drowning in unoxygenated water. Also, change all the water once a week to prevent it from going bad or smelly, and depletion of oxygen. Use a dechlorinator to remove the chlorine from the water. It is a good idea to add some liquid calcium to the water to facilitate development of the crayfish's exoskeleton when it undergoes molting. The ideal aquarium size for a crayfish is a 10-to-15 gallon tank. It is prudent to house a single crayfish in a tank, as they are territorial and may fight with one another. Crayfish require a lot of places to hide, as they love to burrow and dig. Have caves, hollow logs and clay flower pots in the aquarium in which the crayfish can hide. Keep the lid securely closed, as these creatures are known to climb out of their enclosures. If you like, you can grow aquatic plants in the aquarium, but the crayfish will eat them. For decoration, use plastic plants, otherwise normal aquatic plants are fine.